Edited by a team of the world’s leading interventional cardiologists and educators, this new book is created with an eye to giving the reader a solid, practical, and clinically focused understanding of this important class of drugs, from basic science to a clear-headed discussion of complex topics such as combination therapies, drug-to-drug interactions, and resistance to antiplatelet agents. Begins with a concise but thorough discussion of platelet biology and pathophysiology so that readers understand how antiplatelet agents work and why they produce such a varied range of complications, from minor GI upset to potentially life-threatening conditions such as neutropenia, a critical shortage of white blood cells. Thoroughly covers platelet function testing, including novel techniques. Clarifies current best practice regarding the use of antiplatelet agents in both chronic and acute cardiovascular disease. Reviews all types of antiplatelet agents – from aspirin to recently approved drugs – including indications, clinical outcomes, and side effects. 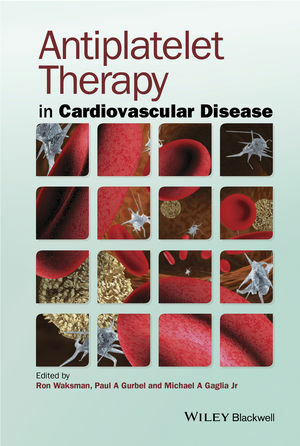 Written by an international “who’s who” of experts in the field, Antiplatelet Therapy in Cardiovascular Disease also includes an entire section covering the use of antiplatelet drugs in PCIs, including percutaneous valve repair, which makes this text particularly essential to interventional cardiologists. Ron Waksman, MD, FACC, is Associate Director, Division of Cardiology and Director of Experimental Angioplasty & New Technologies, Washington Hospital Center, Washington, DC. Dr. Waksman is currently the Editor-in-Chief of Cardiovascular Revascularization Medicine and sits on the editorial boards of six other internationally published journals. He has been Editor/Co-Editor of six books since 1996 and has authored 22 additional book chapters. Dr. Waksman has also authored/co-authored over 250 published manuscripts and over 200 abstracts. He is also a Clinical Professor of Medicine (Cardiology) at Georgetown University, Washington, DC, USA.